This origami A4 Calendar was created by Paolo Bascetta. 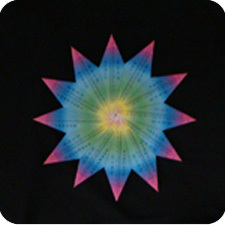 It has an overall sunburst appearance with each of the spikes being a month of the year. Folding the units (spike) is relatively easy. Assembly of the 12 units into the final origami calendar takes a bit of patience. As is often the case, assembling the last unit is most difficult. A4 calendar was originally made with the A4-sized paper. For those who are not aware, the A-series paper sizes are used internationally. United States and Canada are the very few countries which have not converted to the international standard paper sizes. Compared to an 8.5″ x 11″ (letter size) paper, the A4 is little more skinny and a little more longer. A4 dimensions are 8.27″ × 11.7″. 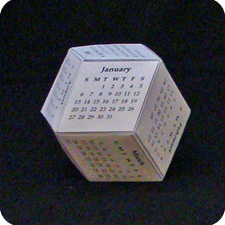 For the purpose of this particular origami calendar, the shape of the paper is not critical. Instead of repeating the instructions on how to fold and assemble this calendar, I will simply direct you to the cdo web site which has instructions in pdf. 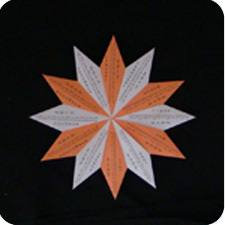 The units are easy to fold and assembly is OK; the final sunburst shape is stable after you have assembled all 12 pieces. The rainbow colored template works well if you print it on white paper. The B&W template can be printed on two different color paper; for example, some on pink and some on white paper. Later, you can assemble the units in alternating colors as shown on the right. 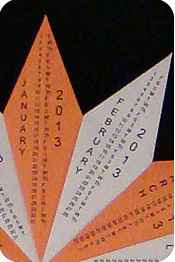 Don’t forget that you can also get Fold-A-Day Paper Airplane or Kirigami calendars which are super cool!